Virgin Mobile is jumping on the mobile TV bandwagon. It has joined forces with BT and Microsoft to offer five digital TV channels and 350 radio channels to its UK subscribers. The deal was announced at the 3GSM World Congress in Barcelona, the mobile phone industry event of the year. TV on mobiles is being touted as the next big thing, with early trials in the UK showing users have an appetite for the service. A pilot scheme by Virgin and BT found that people used the service for an average of more than an hour per week and that most would pay up to £8 a month for watching TV on their mobile. 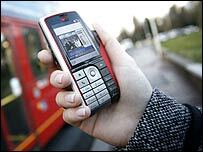 A separate trial in Oxford, conducted by O2, found that nearly 80% of people would subscribe to a mobile TV service. 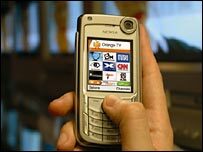 Various operators have been experimenting with mobile TV offerings for some time. Orange, Vodafone and 3 already stream TV channels over 3G mobile networks but this type of service tends to eat up bandwidth. The service from Virgin is expected to go live later this year. "Virgin Mobile customers will be the first people in Europe to watch real broadcast TV over their mobile phones," said Graeme Hutchinson, sales and marketing director of Virgin Mobile in a statement. "It's not downloaded. Its real TV just like you get at home." Virgin is planning to use BT's Movio wholesale mobile TV product. This uses the Digital Audio Broadcasting (DAB) network, broadcasting signals that are picked up by a microchip in the handset. It means that the service could be rolled out almost immediately, in contrast to one using a rival technology called DVB-H, which would require considerable investment. DVB-H could allow a greater choice of channels and is being tested by other firms such as O2 and Orange.